All homes currently listed for sale in the zip code 90015 as of 04/18/2019 are shown below. You can change the search criteria at any time by pressing the 'Change Search' button below. "Style, sophistication and elegance, this 43rd floor penthouse at the Ritz Carlton LA has been completely redesigned and reimagined with the finest of materials and home technology. Creating an estate in a high-rise, the additional fireplaces in the master bedroom and family room add warmth and familiarity, while the Crestron automation system, Lutron lighting system and motorized shades throughout add convenience and simplicity. Every feature has been imagined with form and function in mind. Situated in the premier downtown concierge building with resident-only facilities including: spa & fitness, private lounge and lobby, dedicated concierge, valet parking, complimentary daily breakfast and landscaped Sky Terrace and steps away from world class sports, entertainment and restaurants; this penthouse provides the very best of Los Angeles living and entertaining.Additional Features:* Custom floorplan* Custom master bath with Toto toilet and steam shower* Crestron and Lutron home systems* Tall wine refrigerator in storage room* Custom rugs throughout* Custom cabinets throughout* Projection TV in master bedroom* Two custom fireplaces* Two parking spaces* Wall mounted magnetic iPad control stations throughout"
"Luxurious penthouse located in the upscale South Park District of Downtown Los Angeles. Corner unit is custom designed with only the finest amenities, while enhancing the jaw dropping views of the city and beyond. The home features a Bauhaus open floor plan, accented by an elevated Chef's kitchen with lava stone, designer appliances and Italian glass. Bedroom suites boast designer lighting, built in closets and built in cabinetry. Custom baths. Elegance is at your fingertips: electrical shades, home entertainment system centralized. Hardwood floors throughout residence.In true California style, the penthouse features a spectacular terrace. Here, you can entertain under the stars, with heat lamps, architectural lighting, full running bar, outdoor television and sound system." "Rare 3/3.5 at The Ritz Carlton LA Live. Unit 43C features jaw-dropping unobstructed east head-on views of Downtown LA. This residence features an open floor plan perfect for entertaining, including a large living room, office/den room, chef's kitchen with premium Gaggenau appliances, granite countertops, and custom cabinetry. The master suite features, a stunning luxurious bathroom with a whirlpool tub and a spacious walk-in closet. Additional bedrooms are on the opposite side with the same unobstructed views. Perfect for a family or as a large Pierre de terr for a demanding buyer. Luxury living at its finest with hotel style amenities including swimming pool, gym, doorman/concierge, guest parking with valet and much more." "Welcome to the lavish world of the Ritz Carlton Residence. The experience starts the moment you pull up to the private valet, walk through the newly remolded stunning resident's foyer & up to the 48th floor where you are hailed with jaw-dropping jetliner views of the downtown skyline and beyond. This fabulous west facing light filled unit features walls of glass from every room. The single level floor plan has a private master suite on one wing, with striking views, a spa-like bath fit for a princess, including an oversized soaking tub, marble floors, the finest finishes you would expect at the Ritz & a large walk-in closet. The second wing has 2 additional bedrooms & 2 baths both with endless views of the city. The oversized living room has large walls to showcase art, gleaming South American wood floors & high ceilings. A sleek chef's kitchen with tons of storage & a separate bar/serving room w/a fridge. Designed around the art of entertaining this unit is a rare find." "This stunning Downtown penthouse at the ELLEVEN building is a single-level sprawling trophy unit with floor to ceiling windows, city views, wrap-around terrace, and luxury finishes, all combined to offer that wow factor rarely achieved at this price-point. With 2,660 SqFt inside, and an 800 SqFt outdoor terrace, this residence is over 3,400 SqFt of luxury high-rise living at it's finest. The terrace comes equipped with gas and water hookups for an outdoor kitchen. The great room features city views, fireplace, direct patio access, and room for entertaining, dining and lounging. The kitchen is clad with stone countertops and designer appliances, both bedrooms with direct patio access, walk-in closets, and ensuite bathrooms. The master bathroom includes a separate oversized tub and shower, both offering privacy with romantic city views. A large den/third bedroom, utility/storage room with washer/dryer, two deeded parking spaces and storage room at garage level complete this offering." "Invest in the booming Downtown Los Angeles Market with a Renowned Global Brand. Easily The Most Popular Plan At The Residences at Ritz-Carlton, LA Live. Over 2100 SF, this condo had been used as a 3 Bedrm but on public record as a 2 Bedrm (& has a Den). Set it up however your heart desires! It has the Most Stunning Views as it is a Northwest Corner with Sweeping Ocean, Mountain Range & Skyscraper Views. This plan also has a desirable Open Concept Kitchen & Oversized Master Suite. Ample size 2nd bedroom with en suite bath. Kitchen includes posh appliances by Gaggenau & Dark High Gloss Snaidero Cabinetry. 5 Star Amenities Include Complimentary Daily Breakfast, Billiard Room, Valet, Concierge, Rooftop Pool, Fitness Center & More!" 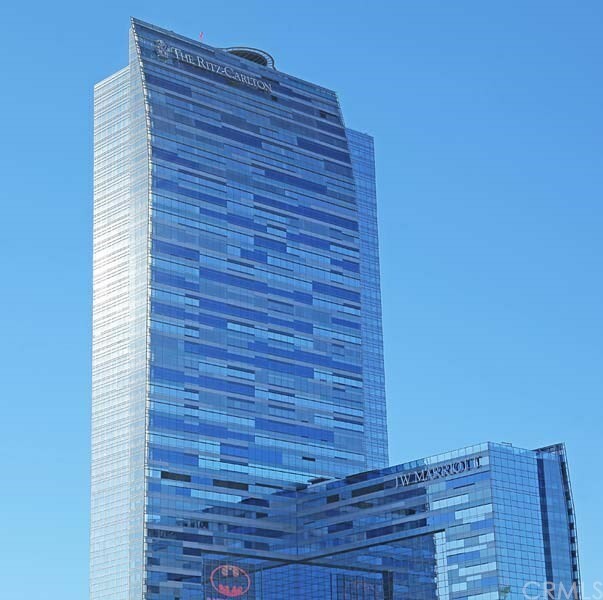 "Invest in the booming Downtown Los Angeles Market with a Renowned Global Brand - The Ritz-Carlton. Located at LA Live, home to the best Downtown attractions. Luxury Southwest Corner 2 bdrm + office is one of the most popular corner plans as it features panoramic views of the Staples Center, Ocean, Sunsets & Hollywood Hills. Master suite is large with a spa-style en suite bathroom. 2nd Bdrm has a large walk-in closet. Enjoy a 5 Star Full-Service living that includes the popular daily breakfast, valet parking, security, concierge, Billiard Room with one of a kind glass pool table, conference/dinner room, screening room, access to the hotel's room service, spa, housekeeping & more." "Stunning views upon entry in this 5 Star, 39th Floor condo at The Ritz-Carlton Los Angeles. Live Where The Action Is & Expect the Renowned Services of this famous luxury Brand, they even treat their Residents to a complimentary breakfast every day. This 2 Bedroom, 3 Bath + Study Nook has Beautiful City, Mountain Range & Landmark Views, including the Famous Hollywood Sign & Griffith Observatory! Kitchen is Open Concept with popular High-End Snaidero Cabinets, posh appliances by Gaggenau & more. The Master Bedroom has a large walk in closet with custom cabinetry & the luxe bathroom has double vanity, a soaking tub & peek a boo window. Includes 2 valet parking, a storage unit & Amenities include a daily breakfast, Billiard Room, Screening Room, Security, Concierge, Gym And More. Building also updating lobby, valet area & more. Please inquire to view the breakfast menu & wellness menu. Remarks"
"Beautiful Southwest corner unit featuring 2 bedroom / 2.5 bath + Office/Den. Almost 2,000 SF, this well appointed home offers panoramic views of the Staples Center, ocean, sunsets and Hollywood Hills. Kitchen features custom cabinetry and Gaggenau appliances. Master suite has his and her closets, custom wall treatments, and large bathroom with rain shower and soaking tub. Automated curtains throughout home. Luxury amenities available to Ritz-Carlton residents include valet parking, daily complimentary breakfast, rooftop salt water pool with private cabanas, fitness center, multi-media screening room, concierge services, and access to the hotel's room service and housekeeping." "Designed by starchitecture firm Gensler, the Ritz-Carlton residences are located in the vibrant community of LA Live; home to numerous entertainment venues & clubs, 20 restaurants, 2 hotels & several globally-celebrated events incl. the Grammys, Emmys, Espys, video music awards and x-games. this 1,760 sqft. 2 bedrooms, 3 baths features elegant details such as Snaidero cabinetry, Gaggenau appliances, LA city light views. valet parking, 24/7 concierge, in-room dining service & housekeeping. a rooftop swimming pool and cabanas, fully-equipped fitness center, 8,000 sqft. full-service spa & salon, executive boardroom, multi-media screening room and residents' lounge all compliment your five-star living experience. email to schedule an appointment for a preview. Currently leased." "Absolutely Gorgeous 27th Floor Southwest Corner Condo at the elite Ritz-Carlton Residences, Los Angeles. This 2 Bedroom + Office has Walls of Windows to Jaw Dropping Views & Seller giving 1 year HOA credit. Also has rare oak/gray floors. Invest in the hot DTLA Market with a Famous Global Brand at this Exclusive Building. This is one of the most popular corner plans as it features panoramic views of the Staples Center, Ocean, Sunsets & Hollywood Hills. Master suite is large with a spa-style en suite bathroom. 2nd Bdrm has a large walk in closet. 5 Star amenities include daily breakfast, valet parking, security, concierge, Billiard Room with one of a kind glass pool table, conference/dinner room, screening room, access to the hotel's room service, spa, housekeeping & more. Building also updating lobby, hallways, elevators & valet gate this year & will be an even more posh building. Furniture staging not included. Agent remarks"
"Introducing a desirable, spacious floor plan at The Ritz-Carlton Residence's, with walls of windows boasting jaw dropping views of the ever evolving Downtown Los Angeles skyline. This meticulously well-kept and pristine three-bedroom, three-and-a-half bathroom residence has been customized to suit five-star luxury living with finishes including a chef's kitchen with Snaidero cabinetry and Gaggenau appliances, custom wall treatments, a spa-like master bathroom with an extensive master walk-in closet, motorized blinds, an additional den or office, and views from every room. Some of the lavish amenities available to Ritz-Carlton residents include valet parking, daily complimentary breakfast, rooftop salt water pool with private cabanas, fitness center, multi-media screening room, concierge services, and access to the hotel's room service and housekeeping." "Wake up mesmerized by the panoramic west and north/south view of Los Angeles offering the height of high-rise living in Los Angeles. South Park's EVO boasts a sleek & contemporary design with floor-to-ceiling windows, concrete accents, stainless steel appliances, couture interiors, designer finishes, endless views and access to Evo's renowned hotel-style amenities. In a marquee location just steps to L.A. LIVE and STAPLES Center LA Live, USC, Metro, & easy access to the 5, 10, 101, & 110 freeways. Evo's amenities include pool, spa, penthouse-level fitness room and lounge, outdoor kitchen, fireplace, 24/7 security, concierge, and on-site management. HOA Includes Internet." "Investor Opportunity as there is a tenant in place through Spring 2020 with great rental rate. Prize building in Downtown Los Angeles, highly desired for it's exterior beauty and luxury brand. Built by the renowned Gensler architecture firm, this is a 28th floor 2 bedroom, 3 bath northeast corner condominium at the Ritz-Carlton LA Live. Stellar views include the DTLA skyline, mountain range & the Griffith Observatory. A popular layout with upscale Snaidero kitchen cabinetry, high-end European appliances & 5 star amenities that include valet parking, security, concierge services, billiard room, conference room, screening room & access to the hotel's room service & housekeeping. Residents also receive a complimentary breakfast every day on the 28th floor. A special and exciting place to live." "Stunning design & views upon entry in this 29th Floor, 5 Star condo at The Ritz-Carlton Los Angeles. Seller Offering Buyer 1 Year HOA Dues Credit. Live Where The Action Is & Expect the Renowned Services of this famous luxury Brand, they even treat their Residents to a complimentary breakfast every day. This 29th FL 2 Bedroom, 3 Bath + Study Nook has Beautiful City, Mountain Range & Landmark Views, including the Famous Hollywood Sign & Griffith Observatory! Kitchen is Open Concept with popular High-End Snaidero Cabinets, posh appliances by Gaggenau & more. The Master Bedroom has a large walk in closet & the luxe bathroom has double vanity, a soaking tub & peek a boo window. Includes 2 valet parking & Amenities include a daily breakfast, Billiard Room, Screening Room, Security, Concierge, Gym And More. Furniture is not included. Building also updating lobby, valet area & more. 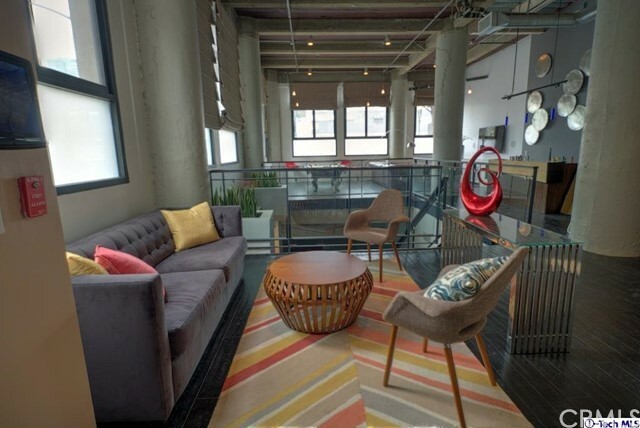 Agent Remarks"
"Stunning, expansive and spacious LOFT in South Park. Unit A006 at the Grand Lofts is the place to live with its ideal location in the heart of Downtown's trendy and growing South Park area. Blending function with sophisticated amenities, the contemporary open and light-filled flex lofts offer residents the unique opportunity to create individual livability. This stunning 2 story, live/work ground level loft with its expansive windows, espresso finish hard wood floors, high ceilings, architectural custom cabinetry, alabaster wet bar, modern kitchen with stone countertops and stainless steel appliances, 3 full baths, 2 bedrooms plus added sleeping area, custom frosted glass entry doors to downstairs bedrooms, solid core entry doors, washer and dryer, direct street entrance, plus 2 additional entrances to unit, is a unique living space in the center of South Park. Walking distance to Staples Center, LA Live restaurants and entertainment, Nokia theater, and all the other attractions located in DTLA." "This stunning residence at EVO is the true embodiment of space, utility, and contemporary high-rise luxury-living fused with jaw-dropping views. Over 2,300 feet of living space allow for a bright and airy living experience accentuated by sweeping views of the city skyline and beyond. This northwest corner soft-loft includes high ceilings, floor-to-ceiling windows with electric shades, a large balcony, and rich hardwood floors that adorn the majority of the home, while the bedrooms are softened with Berber carpeting. Additional features include an open plan kitchen with stainless steel appliances, stone counter tops, and and a large functional kitchen island as well as a laundry room with washer & dryer, great closet space, extra storage space, and two parking spaces. Residents can enjoy a plethora of amenities including 24-hour concierge and security, sixth-floor pool deck, spa and kitchen and a penthouse-level fitness center and resident's lounge with skydeck and an outdoor fireplace." "Great news..tenant is out and this unit can be shown so easily just a phone call or text!! Welcome to the Ritz Carlton residence in Downtown Los Angeles. Luxury living. Enjoy the views of sunset, ocean, Hollywood sign from the 30th floor. Walk to La live and Staple center and Microsoft theater.Round the clock valet, concierge,and security. Free breakfast bar and use of media and conference rooms. Rooftop pool and cabanas. This 2 bedroom model unit, ultimate contemporary life style is facing north west , state of the art appliances and European design. View, view and view from the kitchen, bedrooms,living room and dinning room even the master bath.There is a small office in this unit which is a must. State of the art fitness room with the latest equipment ...you have to see this to appreciate this ultimate luxury resort. Call or text the agent for a personal tour." "Breathtaking views and unparalleled luxury of the Ritz Carlton Residences await you. Beautiful 1 bedroom 2 bath unit in the exclusive residences. Situated on the 40th floor, natural light floods every room of this beautifully appointed unit. Enjoy the 5 star amenities 24/7 concierge service, full spa and fitness center, rooftop pool, exclusive residential lounge, valet parking and more. 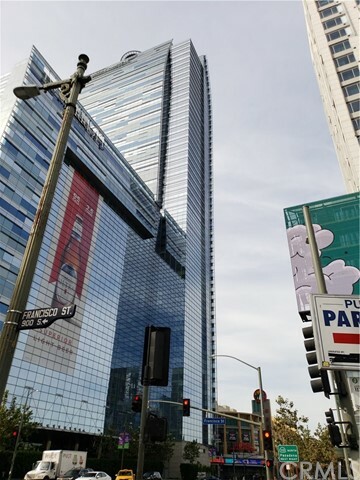 Conveniently located in the vibrant heart of DTLA, in walking distance to the Staple Center and restaurants." "Imagine living in a home with high-quality concierge and room service of a five-star hotel 365 days out of the year. Welcome to the Ritz Carlton, luxury living at its finest. One of the most flexible floor plans The Ritz Carlton Residence has to offer, this two-bedroom, two-bathroom home has staggering East-facing views of Downtown Los Angeles' city lights, and overlooks the Staples Center and the pool. The Residences offers 24/7 full concierge service, complimentary breakfast served daily in the Sky Lounge. Breakfast normally includes savory meats, waffle bar, fresh fruit, juices, and coffee. Residents also enjoy valet parking, rooftop pool, fitness center access and special discounted rates at the Ritz Carlton Signature Spa. One parking space included with HOA and additional spaces available at additional rates. Basement storage locker also included in price." 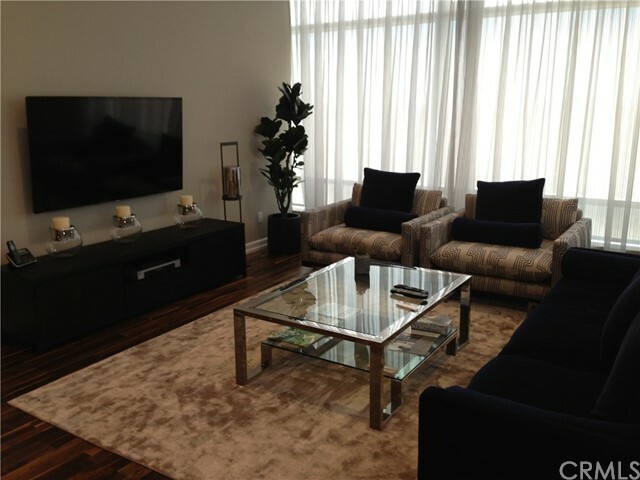 "Beautiful remodeled corner unit in Luma, South Park DTLA's premier luxury living. Soft loft with immaculate wood floors, custom ceiling molding through-out, faux bronze antiqued concrete columns, beautiful pendent light chandeliers, museum curtains throughout, high-end drapery and Japanese style frosted glass sliding doors at the bedrooms, + each bedroom with own full bathroom, and extra 3rd guest bathroom at the entrance. Expansive panoramic city views from floor-to-ceiling windows and large balcony. CONVENIENT GROUND FLOOR PARKING BY PARKING ENTRANCE/EXIT & LOBBY. Luma is a Green building, LEED Certified GOLD (low electricity costs). Bldg. has 24/7 security & concierge, gym, pool, spa, sundeck, and BBQ area on large outdoor terrace. Neighborhood amenities incl. Staples Ctr., LA Live, Ritz-Carlton, soon-to-come Oceanwide Plaza, Regal Movie Theaters, Ralph's, Whole Foods, and moments from all of DTLA's restaurants and hotspots. AGENTS SEE PRIVATE AND SHOWING REMARKS!" "Looking to downsize your living space, but not your lifestyle? Does your demanding career have you longing for a pampered home life? Do you dream of living the resort lifestyle on a daily basis? Ritz-Carlton Luxury Residences located in the heart of vibrant LA Live is for you! Dedicated Concierge, Valet Parking, 2 parking spaces with storage, Daily Complimentary Breakfast, 24/7 Security, Business Center, Doorman, Fitness Center, Rooftop Pool, Spa, Theater Room, Private Lounge, Landscaped Sky Terrace, Exclusive Boardroom, and all the unrivaled Hotel Services of The Ritz Carlton. A beautiful Unit with panoramic views from every room; eastern(sunrise! ), city lights, LA Live. Well maintained, space for an office or walk-in closet, contemporary high-end finishings, like new. Shower in second bath. Are you looking for an investment property? There is a tenant is in place who is able to move or stay put. A great opportunity for the best of luxury condo livi"
"This stylish condo is located on the 31st floor and has gorgeous views of Downtown Skyscrapers, LA Live, Ritz-Carlton Pool & More! At over 1140 SF, the spacious condo has a beautiful white high gloss kitchen cabinetry & an inside washer and dryer. The unit also features beautiful paint upgraded carpet with recessed lighting throughout. With it's own dedicated lobby and concierge, the Residences offer complimentary breakfast for residents, valet parking, security, media room, billiard room, & more." "Luxury 37th Floor 1 Bedroom at The Ritz-Carlton Los Angeles. Gorgeous views upon entry, this 1 bedroom plus mini den has custom built ins & features 2 bathrooms with walls of windows. The only 1 bedroom plan with a shower in the 2nd bathroom & also has a larger laundry room. The owner has upgraded with added recessed lighting & opened up the bedroom entry. With upgrades at approximately $100,000, there are also motorized shades & owner has enlarged the closet space in the bedroom as well. Live the ultimate luxury lifestyle at The Ritz Carlton Los Angeles and have easy access to room service, housekeeping, restaurants, shops, movie theater, concerts and more. 5 Star Amenities include a complimentary daily breakfast, screening room, billiard room, fitness center, rooftop saltwater pool & more. Walkability score in the 90s. Agent Remarks."